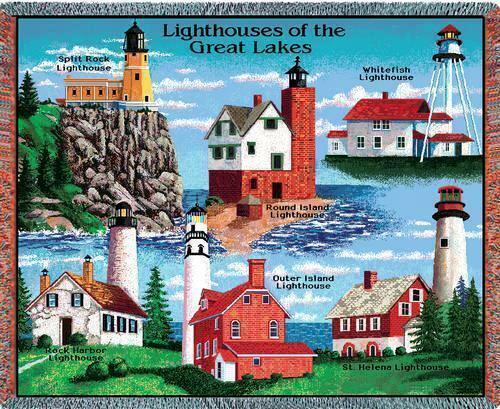 "Great Lakes Lighthouses Throw" This colorful cotton throw, woven on Jacquard looms, depicts famous landmark lighthouses of the U.S. Great Lakes. This makes a wonderful gift for the lighthouse enthusiast! Lighthouses featured are Split Rock, Round Island, Whitefish, Rock Harbor, Outer Island, and St. Helena. Cotton. Measures 53" Wide x 70" Long. PLEASE NOTE: Shipping ONLY within the continental U.S. Hawaii, Alaska, and Puerto Rico residents please contact seller for shipping quote before ordering.